If you ever wondered about how to write a book report, you need to look no further than this page. WhiteSmoke writing software is happy to present you with the following guidelines for writing a book report, and offer you the best solution on the market for the actual writing, too. The first thing to know about how to effectively write a book report is what a book report actually is. A book report is an objectively written document that tells the reader about the structure and content of a book, and which does not make comparisons between the book at hand and others. What is contained in the book is summarized in a book report, as well as an analysis of the structure. If you need to know how to write a 4th grade book report, remember these same principals, but write about them in a simpler way. To continue with the guidelines about how to write a great book report, we're presenting all of the information that you should include in the report. You may find it useful to write an outline at some point during the process to organize your ideas and information. Here you should give the full name of the author; full title of the book; editor of the book (if there is one); location, publisher, and date of publication; the edition (if applicable); and the number of pages. Here you should provide information about the author that demonstrates how s/he is qualified for writing in the field, or how any influences might have affected the point of view of the author. If there are any interesting things that happened that led to writing the book, include them here. Here, classify the book according to what kind of book it is. For example, a non-fiction book might be categorized as history, travel, biography, autobiography, etc. Also classify the book based on the author's intention, meaning who the book was meant for. Here, create a single, strong thesis sentence that tells the reader what the book is about (the subject) as well as what the author's point of view is on that subject. Check out WhiteSmoke's page about how to write a thesis statement if you feel you need to brush up on this. Here you must support your thesis and expand on it. Highlight the organization of sub-subjects,how they are related to each other and the main point of the book. In this section, you should very briefly present the main ideas that support the author's argument, following the order the author used. You may present this information with the analysis of structure or discuss it separately. Even though you should focus on the structure and content of the book you are reporting on, you can include some criticism or opinion. These tips will help you with how to write a good book report, but remember that every assignment may include different criteria and that each professor or teacher may have different expectations, so keep these in mind as guidelines and not a definitive resource. The format for writing a book report might follow the above tips, or you may rearrange information as you see fit. Once you write your document using this help for writing a book report, don't forget to proofread it thoroughly. Get effective proofreading help from WhiteSmoke, the best writing tool. Click once and check English grammar, spelling, and punctuation. 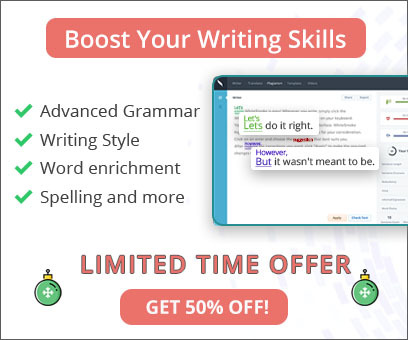 In the same click, access an online dictionary and thesaurus, plus a unique enrichment feature that adds descriptive, context-based adjectives and adverbs for the ultimate in writing improvement. 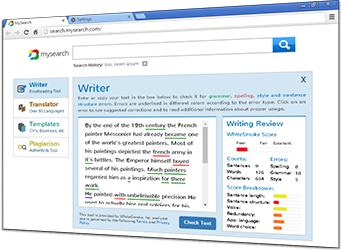 Write the best book report using WhiteSmoke online writing software.